In my opinion, featuring characters on book covers is a blade that cuts both ways. Most of the times I am not thrilled to see the characters given face on the cover, it leaves my imagination without a blank canvas from where to start its work, I like it more when my mind can project the image of the characters, based on the descriptions found within the pages of the book. There are some such covers, however, I have nothing against. 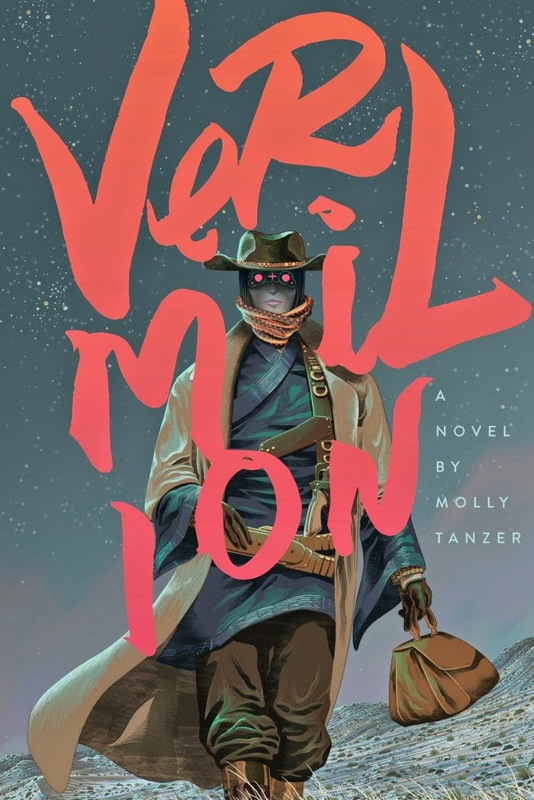 For example, the cover of Molly Tanzer’s debut novel “Vermilion”, although it features the main character the cover leaves plenty of room for my own imagination to weave around it. There is something else about this artwork that makes me like it quite a bit, it reminds me of the western movies, the moment when someone steps beyond the swinging doors of a bar and the figure silhouetted by the outside light casts an air of mystery. True, in the case of Molly Tanzer’s “Vermilion” book cover the character is not shrouded in shadows, but she still radiates an air of mystery. Looking over the cover I want to know what the story of this character is, who she is and what she seeks. Of course, the synopsis of the novel offers a couple of short answers, but at the same time adds further intriguing elements. From my point of view, the combination of gripping synopsis, the previous excellent experience I had with Molly Tanzer’s short stories and the great cover, designed by Osiel Gómez and featuring the art of Dalton Rose recommends “Vermilion” as one of the novels not to be missed this year. The novel will be released on April 15th by Word Horde. Gunslinging, chain smoking, Stetson-wearing Taoist psychopomp, Elouise “Lou” Merriwether might not be a normal 19-year-old, but she’s too busy keeping San Francisco safe from ghosts, shades, and geung si to care much about that. It’s an important job, though most folks consider it downright spooky. Some have even accused Lou of being more comfortable with the dead than the living, and, well… they’re not wrong. When Lou hears that a bunch of Chinatown boys have gone missing somewhere deep in the Colorado Rockies she decides to saddle up and head into the wilderness to investigate. Lou fears her particular talents make her better suited to help placate their spirits than ensure they get home alive, but it’s the right thing to do, and she’s the only one willing to do it. Crowdfunding campaign - "Castles in Spain"